Light and mildly spiced as well as sweet kadhi with a hint of ginger and green chili, having soupy consistency is Gujarati kadhi. It is tempered with mustard seeds, cumin seeds, curry leaves and served with Gujarati khichadi to make a soulful meal. It can also be served with chapati, rice etc. 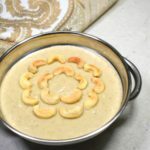 Opposed to the common belief, Gujarati Kadhi recipe calls for fresh yogurt. Yes, we don’t need sour curd for it. 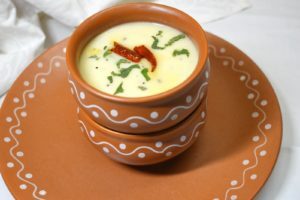 Gujarati kadhi is not very tangy, in fact, no flavor dominates. To keep it mild, fresh yogurt should be used. Gram flour is added; comparatively less gram flour is added in Gujarati Kadhi recipe. More than the ingredients correct method of cooking is important to make Gujarati kadhi. 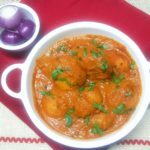 The things which should be taken care of to avoid curdling of kadhi have already been explained in the post for Punjabi kadhi pakoda. 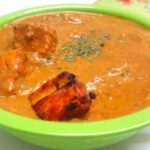 Another kadhi recipe is the very distinct Sindhi kadhi. View the recipe here. You might also like besan ki kadhi and pakoda. View the recipe here. 1. In a mixing bowl add 1 cup yogurt (dahi) and 2 tbsp gram flour (besan). Mix well. 2. Add in 2 and ½ cups of water. Whisk it well. Keep aside. 3. In a pan heat 1 tbsp ghee and add ½ tsp mustard seeds (raie), once it splutters, add ½ tsp cumin seeds (jeera). Cook for 30 seconds. 4. On a low flame pour the yogurt gram flour mixture in the tempering. 6. 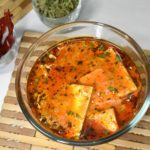 Add in 1 sprinAdd in 1 spring of curry leaves, ½ tsp ginger paste and 1 slit green chili.g of curry leaves, ½ tsp ginger paste and 1 slit green chili. 7. Time to add something that makes Gujarati kadhi distinct. Add 1 tbsp sugar. 8. Not to miss salt to taste. 9. Let it cook for 10-15 minutes. Keep the flame low. Keep stirring. 10. Switch off the flame and add a handful of chopped coriander leaves. Check the consistency and seasoning. 11. Prepare another tempering. Heat 2 tsp ghee and add 1 broken red chili. Cook for 30 seconds and pour on the kadhi. 1. 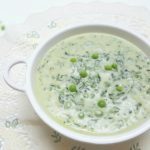 In a mixing bowl add 1 yogurt and 2 tbsp gram flour. Mix well. 4. On a low flame put the yogurt gram flour mixture in the tempering. 6. Add in 1 spring of curry leaves, ½ tsp ginger paste and 1 slit green chili. 10. Switch off the flame and add a handful of chopped coriander leaves.